When I discuss these principles outside the company I’m often meet with skepticism, and understandably so. It’s a pretty different model of leadership than the traditional top-down American style. If it’s so effective, where are all the massively successful examples of it at work? To be honest with you, I can’t point to them. The biggest successful example of these practices at scale I’ve found is Asana. These ideas are fairly novel though, and so will take some time to permeate though American culture. I’m hoping that Clearbit will be such an example one day. The following is an abbreviated extract from the book. I’m not doing it justice though, so please consider buying the book and supporting the Conscious Leadership Group’s work. At any point, a leader is either above the line or below the line. If you are above it, you are leading consciously, and if you are below it, you are not. Above the line, one is open, curious, and committed to learning. Below the line, one is closed, defensive, and committed to being right. Many people lead from below the line - it’s a common state stemming from millions of years of evolution. As soon we we sense the first whiff of conflict our lizard brain kicks in. Fear and Anger rise up, we get defensive and double down on being right. At this point we’re firmly below the line. Knowing that you’re below the line is more important than being below the line. The first mark of conscious leadership is self-awareness and the search for truth. The second is pausing, taking a second, and shifting yourself into a open and curious state, and rising above the line. The following are principles to live your life by in order to shift yourself above the line. Taking full responsibility for one’s circumstances (physically, emotionally, mentally, and spiritually) is the foundation of true personal and relational transformation. Blame, shame, and guilt all come from toxic fear. Toxic fear drives the victim-villain-hero triangle, which keeps leaders and teams below the line. Conscious leaders and teams take full responsibility—radical responsibility—instead of placing blame. Radical responsibility means locating the cause and control of our lives in ourselves, not in external events. Instead of asking “Who’s to blame?”, conscious leaders ask, “What can we learn and how can we grow from this?” Conscious leaders are open to the possibility that instead of controlling and changing the world, perhaps the world is just right the way it is. This creates huge growth opportunities on a personal and organization level. Self-awareness and learning agility are known to create sustained success in leaders—they form the foundation of conscious leadership. Conscious leaders are passionately committed to knowing themselves, which is the basis of their willingness to live in a state of curiosity. 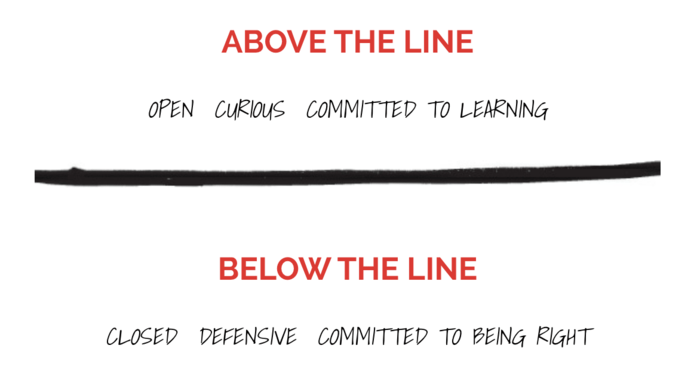 At any point, leaders are either above the line (open, curious, and committed to learning) or below the line (defensive, closed and committed to being right). Being “right” doesn’t cause drama, but wanting, proving, and fighting to be “right” does. Even though conscious leaders get defensive like everyone else, they regularly interrupt this natural reactivity by pausing to breathe, accept, and shift. I commit to feeling my feelings all the way through to completion. They come, and I locate them in my body then move, breathe, and vocalize them so they release all the way through. Great leaders learn to access all three centers of intelligence: the head, the heart, and the gut. Resisting and repressing feelings is standard operating procedure in most organizations. Feelings are viewed as negative and a distraction to good decision-making and leadership. Conscious leaders know that feelings are natural and expressing them is healthy. They know that emotion is energy in motion; feelings are simply physical sensations. The four primary emotions are anger, fear, sadness, joy. Knowing how to express them all of the way through to completion helps us develop emotional intelligence. Each primary emotion has a unique energy pattern and set of sensations in and on the body. Every feeling we experience invites us in a specific way to grow in awareness and knowing. Repressing, denying, or recycling emotions creates physical, psychological, and relationship problems. To release emotion, first locate the sensation in the body and then vocalize the feeling. Conscious leaders learn to locate, name, and release their feelings. They know that feelings not only add richness and color to life but are also an essential ally to successful leadership. Leaders and teams have found that seeing reality clearly is essential to being successful. In order to see reality clearly, leaders and organizations need everyone to be truthful and not lie about, or withhold, information. They need candor. Candor is the revealing of all thoughts, feelings, and sensations in an honest, open, and aware way. Speaking candidly increases the probability that leaders and teams can collectively see reality more clearly. Withholding is refraining from revealing everything to all relevant parties. Withholding also decreases energy in leaders, which often shows up as boredom or lethargy in them and relational disconnection in the team. Rather than withholding, conscious leaders practice revealing. They reveal not because they are right, but because they wish to be known. Through this transparency, they create connection and open learning. Conscious listening is one of the most important skills for effective leadership: by identifying our listening “filters,” we can let go of them and become fully present to the expression of the other person. Conscious listening takes courage: we must listen for the content (head center), the emotions (heart center), and base desire (gut center) being expressed by the other person. It is best to start with candor in relationships only when you have a shared commitment to it, along with the necessary skills, including being able to speak unarguably. I commit to ending gossip, talking directly to people with whom I have a concern, and encouraging others to talk directly to people with whom they have an issue or concern. Even though gossip has long been a part of office culture, it is a key indicator of an unhealthy organization and one of the fastest ways to derail motivation and creativity. Gossip is a statement about another made by someone with negative intent or a statement the speaker would be unwilling to share in exactly the same way if that person were in the room. Gossip is an attempt to validate the righteousness of a person’s thinking and is below the line; it is not a comment designed to serve the person being discussed. People gossip to gain validation, control others and outcomes, avoid conflict, get attention, feel included, and make themselves right by making others wrong. In short, people usually gossip out of fear. If you gossip, clean it up by revealing your participation in the gossip to everyone involved. When leaders and teams learn to speak candidly with each other, they benefit from the direct feedback about issues within the organization that otherwise could derail creative energy and productive collaboration. I commit to the masterful practice of integrity, including acknowledging all authentic feelings, expressing the unarguable truth, keeping my agreements, and taking 100% responsibility. Integrity is the practice of keeping agreements, taking responsibility, revealing authentic feelings, and expressing unarguable truths. It is essential to thriving leaders and organizations. Conscious leaders are impeccable with their agreements. They make clear agreements, keep them, renegotiate them when needed, and clean them up when broken. Integrity is fundamental to conscious leadership and successful thriving organizations. Committing to appreciation, along with avoiding entitlement, helps leaders and organizations grow value and connection in the workplace. Appreciation is comprised of two parts: sensitive awareness and an increase in value. Entitlement arises when rewards and benefits become an expectation instead of a preference. Living in appreciation has two branches: being open to fully receiving appreciation and being able to fully give appreciation. For most, it is more difficult, and people are more afraid, to receive appreciation than to give it. To avoid receiving appreciation, people strategically deflect it. Masterful appreciation is sincere, unarguable, specific, and succinct. Appreciation allows the unique gifts in the community to be recognized. I commit to creating a life of play, improvisation, and laughter. I commit to seeing all of life unfold easefully, and effortlessly. I commit to maximizing my energy by honoring rest, renewal, and rhythm. Creating a life of play, improvisation, and laughter allows life to unfold easily and energy to be maximized. Play is an absorbing, apparently purposeless activity that provides enjoyment and suspends self-consciousness and a sense of time. It is also self-motivating and makes you want to do it again. An imposed nose-to-the-grindstone culture will lead to higher levels of stress, guilt, employee burnout and turnover. Energy exerted with this type of “hard work” is wrought with effort and struggle, whereas energy exerted through play is energizing. Most leaders resist play because they think they will fall behind if they aren’t seriously working hard. Organizations that take breaks to rest and play are actually more productive and creative. Energy is maximized when rest, renewal, and personal rhythms are honored. Conscious leaders who value and encourage an atmosphere of play and joy within themselves and in their organizations create high-functioning, high-achieving cultures. I commit to seeing that the opposite of my story is as true as or truer than my original story. I recognize that I interpret the world around me and give my stories meaning. Conscious leaders practice simple ways to question the beliefs that cause suffering, starting with “Is it true?” and “Can I absolutely know it is true?” The turnaround exercise allows leaders to practice shifting their beliefs from knowing to curiosity. When conscious leaders let go of the righteousness of their beliefs, they open to curiosity and align with their deepest desires.